Marshalls CPM have designed this off site solution precast chamber to accommodate a weir wall that can be pre-fitted either a Hydro-Brake Optimum™, Hydro-Brake®, Penstock, Non-Return Flap Valve, Orifice plate or a combination of them. 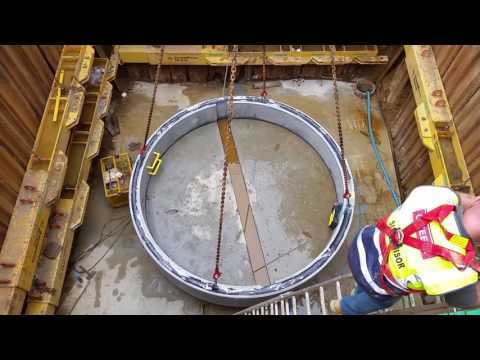 The precast concrete chamber can be designed to suit most pipe sizes and at any chamber depth, the design also includes a twin access heavy duty precast concrete cover slab and a hole can also be provided for the penstock spindle. Marshalls CPM can supply sectional weir walls system in the following sizes:- 2000mm, 2100mm, 2400mm, 2700mm, 3000mm or 3660mm or a 2100mm one-piece unit. The Marshalls CPM one-piece precast chamber is fabricated using a base unit complying BS EN 1917:2002. To find out more about Weir Wall Chambers, please call our Sales Team or fill out the enquiry form and we’ll get back to you within 24 hours.